These photos were taken Saturday at Smog City Brewing Company where several hundred of Smog City’s fans gathered to help Jonathan and Laurie Porter celebrate four years of brewing at their Torrance location. These photos were taken at the 2nd Annual Jeff Sanders Memorial Homebrew Competition which was held Saturday at the Robert Gennaria Memorial Odd Fellows Hall in Redondo Beach. The event was put on by the Strand Brewers Club and was sponsored by South Bay Brewing Supply, King Harbor Brewing Company, Naja’s Place, Smog City Brewing Company, and Strand Brewing Company. There were 47 entries judged, all of which were limited the Jeff’s favorite styles, which meant there were lots of barleywines, English-style ales, porters and such. South Bay residents may recall hearing about a terrible crash that happened in Torrance on March 7 that resulted in the death of 16 year old South High School student, Jesse Esphorst, Jr. The circumstances surrounding the accident and Jesse’s death were bad enough; but Jesse’s father, who was driving when they were hit by two cars that blew through a red light, was also seriously injured. The family, who had numerous other obstacles draining their bank account at the time of the accident, now had to deal with funeral expenses for Jesse and medical expenses for his father who is currently unable to work due to his injuries. On Saturday afternoon, Select Beer Store, in Redondo Beach celebrated their 5th Anniversary by bringing in craft beer from some of their favorite local craft breweries. Barley Hops Grill was also there with their special style of barbecue. As I was going through my notes I noticed that it was five years ago, during the 7th Annual American Craft Beer Week that I first visited Select Beer Store for their South Bay Tap Takeover which featured all four of the South Bay’s breweries; El Segundo Brewing, Monkish Brewing, Strand Brewing and Smog City Brewing. These photos were taken at the inaugural L.A. Beer and Food Festival, which was presented by the Los Angeles County Brewers Guild Saturday afternoon at the Mack Sennett Studios in the Silver Lake area of Los Angeles. I was going to say that for an inaugural event, the turnout was outstanding; but the reality is that they sold out 650 tickets, which is pretty outstanding whether it was the inaugural or 10th annual event. The reality is that the venue probably could not hold much more and remain comfortable. The long anticipated opening of Smog City Brewing Company’s SteelCraft location has arrived. These photos were taken late Wednesday afternoon at the “friends and family” soft open that was held primarily for the friends and family of the people that assembled the SteelCraft enclave. After talking to a few attendees, it seemed like the news spread around the Bixby Knolls neighborhood quickly as the SteelCraft park began filling up with locals that expressed that they were happy to save the Uber expense of traveling to Torrance as the SteelCraft location was walking distance from their homes. Recently there have been a couple articles circulating around social media claiming to list all of the South Bay breweries; one that went around yesterday missed four or five of them, depending on whether or not a tasting room was required. As the Craft Beer Guy I have been fortunate to have this craft beer boom explode all around my home; I also feel obligated to provide an accurate list of all the breweries currently brewing in the South Bay as well as the next two scheduled to open. These photos were taken Thursday evening at Flights during their 2nd Annual South Bay Tap Takeover. 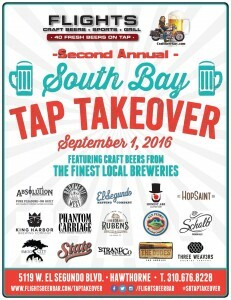 This year we featured 15 of the best production breweries in the South Bay; with Absolution Brewing, Brouwerij West, El Segundo Brewing, Honest Abe Hard Ciders, HopSaint Brewing Company, King Harbor Brewing, Phantom Carriage, Rob Rubens Distilling & Brewing, San Pedro Brewing Company, Scholb Premium Ales, Smog City Brewing, State Brewing Company, Strand Brewing Company, The Dudes’ Brewing, and Three Weavers Brewing filling all four tap lines. I watched as people in the craft beer industry as well as the hundreds of craft beer fans looked with amazement at what a South Bay tap list looks like. 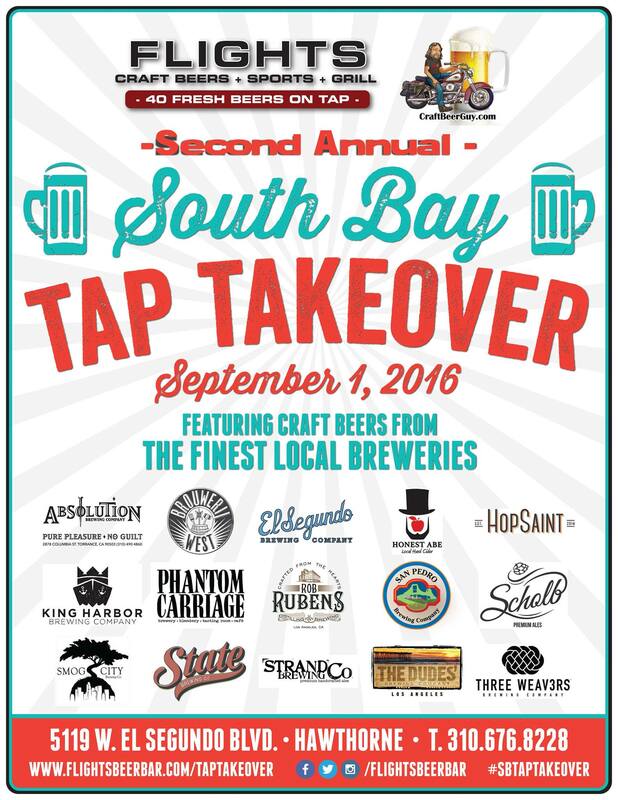 Those of you that follow the Pilot Batch column or my Facebook page have probably heard, but for everyone else, I am happy to announce that Craft Beer Guy and Flights will be holding their 2nd Annual South Bay Tap Takeover on September 1, 2016 at Flights beer bar in Hawthorne, from noon until at least midnight.